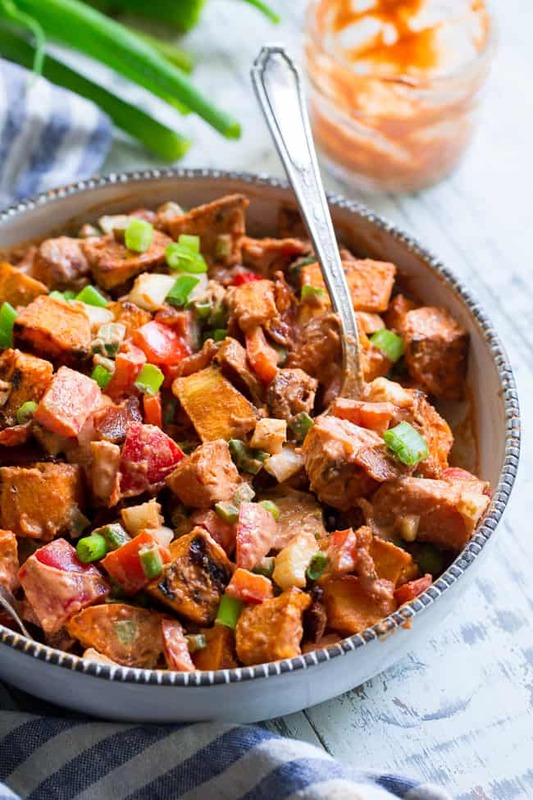 This BBQ Ranch Sweet Potato Salad is loaded with flavor and goodies! 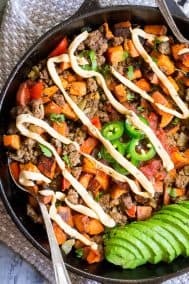 Roasted sweet potatoes are tossed with peppers and onions, crispy bacon, and an easy Whole30 compliant BBQ ranch dressing. 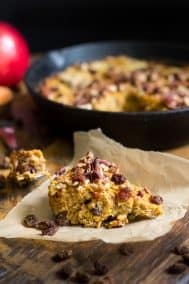 It’s family approved, perfect for any summer party and no one will guess it’s paleo! We’re back again with another terrifically tasty potato salad recipe – this time with sweet potatoes – the potatoes that are near and dear to my heart in ways I never thought possible. Especially in this recipe. But now I say things like that all the time – it’s true! 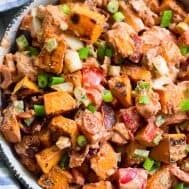 So you’ll just have to go on faith alone (and perhaps good taste) to know that this BBQ ranch sweet potato salad is something special. I mean, to be honest the idea of BBQ ranch anything is pretty special to me – and sweet potatoes are an amazing companion for this dip/dressing. 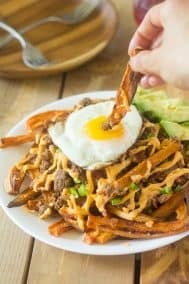 I first made a Whole30 BBQ Ranch Dip for my crispy baked sweet potato fries back when I did my January Whole30 this past year. Originally, I simply mixed together my BBQ Sauce and Ranch Dressing to see what would happen. Of course, it tasted incredible and I knew I had to figure out a recipe to make it from scratch – that’s the moment my BBQ ranch dip was born! 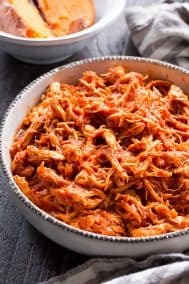 Now, I’ve since realized that for those who don’t want to have to use a blender to make the dip, you can actually sub in a Whole30 BBQ sauce like Tessemae’s for the BBQ part of the recipe. That way, all you need to do is whisk the dressing together in a bowl and forget about pureeing dates. Aside from the dressing here, we have lots of other favorites. Roasted sweet potatoes, to start with! I always find that I prefer my sweet potato salads to start with cooled roasted sweet potatoes rather than boiled or steamed – the flavor is intensified in a delicious way! Next of course, we have sugar-free bacon because as I said yesterday in my Chipotle Lime Potato Salad post, I just can’t do potato salad without bacon! Luckily, it’s so much easier to find good sugar free bacon now than ever before. 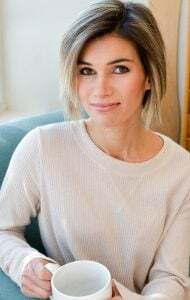 I love U.S. Wellness Meats, Jones Dairy Farm or Pedersen Farms for quality uncured sugar free bacon. To go with the southwest vibe, I added diced bell peppers and onions as well as a minced jalapeño pepper for spice and crunch. The result is smoky, savory, sweet and zesty perfection! This Whole30 and paleo potato salad would be perfect for July 4th or any (and every!) backyard BBQ this summer. It also happens to be delicious to eat the next day for lunch, too – and trust me – you’re going to want to save any leftovers for yourself! I hope you’re ready for BBQ Ranch bliss! 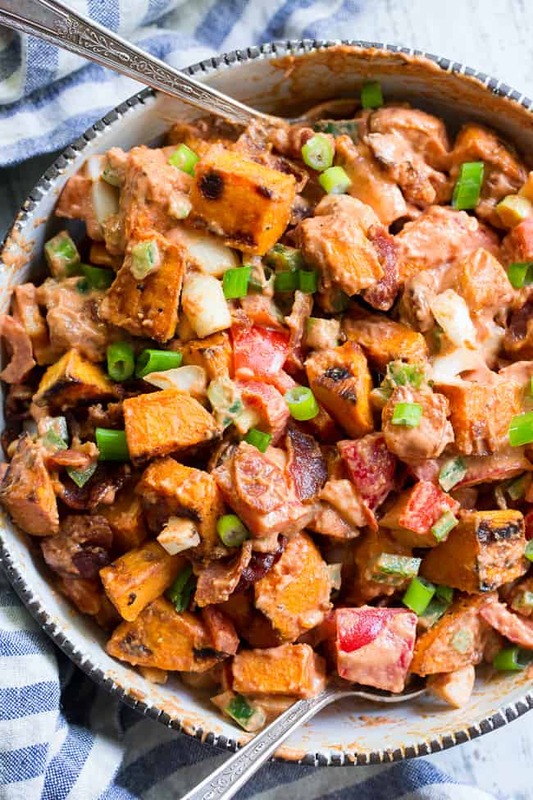 Let’s get our sweet potatoes roasted and make our new favorite sweet potato salad! 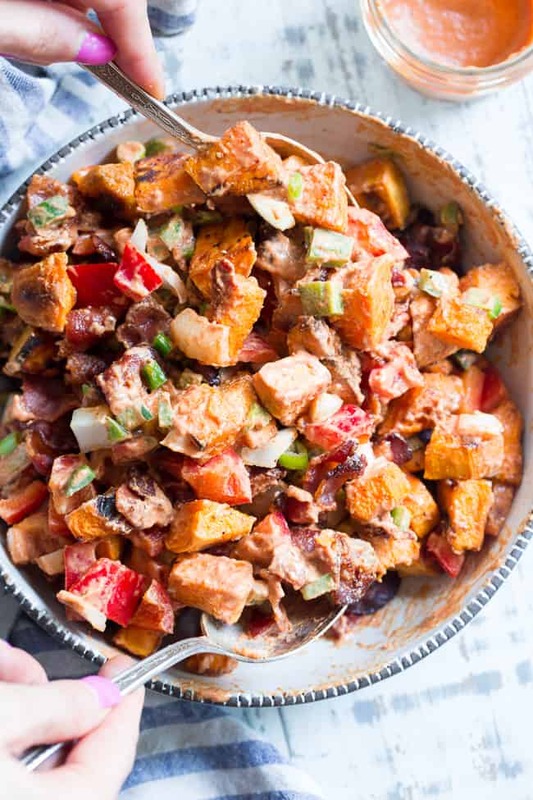 This BBQ Ranch Sweet Potato Salad is loaded with flavor and goodies! 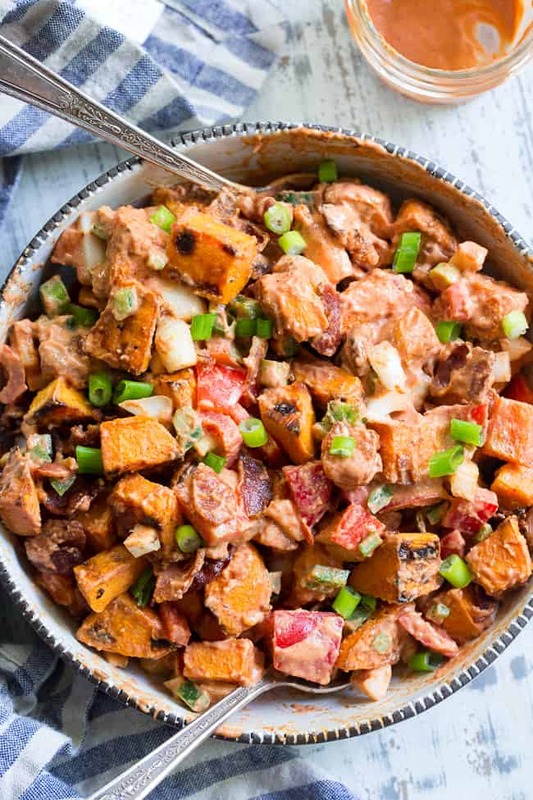 Roasted sweet potatoes are tossed with peppers and onions, crispy bacon, and an easy Whole30 compliant BBQ ranch dressing. 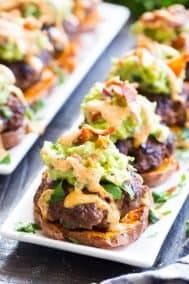 It's family approved, perfect for any summer party and no one will guess it's paleo! Soften the date if necessary by soaking in hot water for a minute or two. 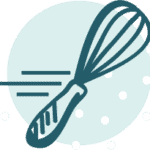 Place all ingredients in a high speed blender or food processor and blend until smooth. Remove dressing to a small bowl and set aside until ready to use. Toss the cubed sweet potatoes with 1 tbsp bacon fat (or preferred fat), sea salt, black pepper, and smoked paprika. 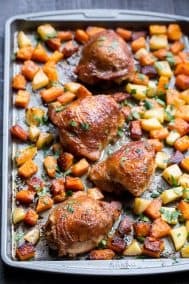 Spread out in a single layer on the baking sheet without overlapping. Use an extra baking sheet if necessary. Roast for 20 minutes, turn (or stir gently) then roast another 10-15 minutes or until soft and lightly browned. 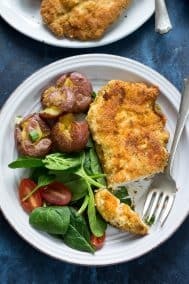 Allow potatoes to cool on the baking sheet until they reach room temperature. 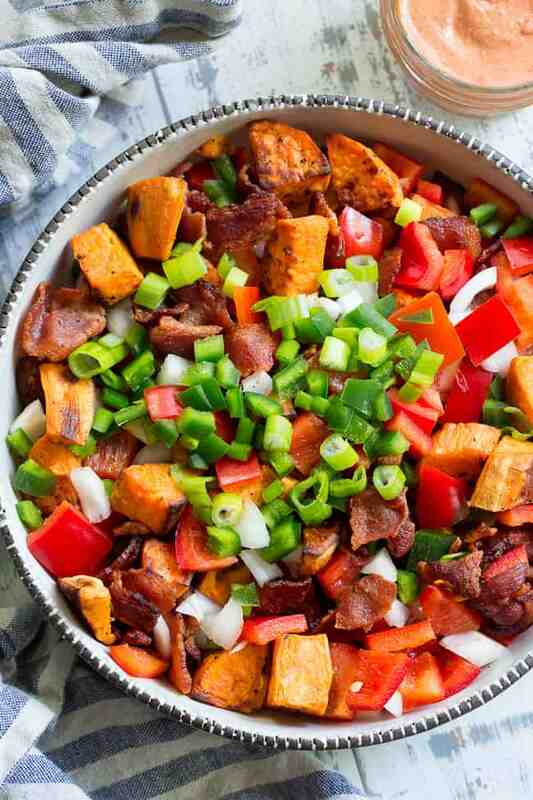 In a large bowl, toss the sweet potatoes with the bacon, bell pepper, onion, jalapeno and scallions. Toss with the dressing (using as much or as little as you like - I used all of it) and serve immediately. Store leftovers tightly covered in the refrigerator for up to 3 days. Enjoy! *You can also replace the first 5 ingredients with 1/3 cup Tessemae’s Whole30 compliant BBQ Sauce to simplify and avoid having to blend. In this case, just stir all ingredients together. I was wondering the same thing since it called for date(s), plural. 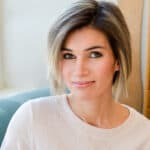 Has anyone confirmed this yet? Would like to make for the 4th. Yes 1 medjool date since it adds the perfect amount of sweetness. It’s really delicious, you love it! Wow. This looks amazing. I cannot wait to try it. 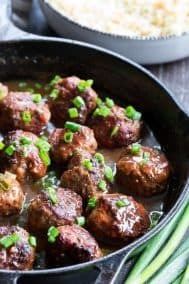 Usually, I am following the recipes from https://bit.ly/2tH5gxt , but your recipe looks absolutely delicious. can you replace the mayo wirh greek yogurt? another hit, well done Michele.